The latest data on children looked after in England (including adoption) was published in November 2018. There are some continuing trends in the looked after children (LAC) data, including the continued fall in the number of LAC who are being adopted, which we have discussed in previous blog posts. Another area of interest is the issue of LAC who go ‘missing’ each year. 11% of the LAC population go missing every year, with 65% of these children going missing more than once according to the most recent data. The LAC data on missing incidents are currently experimental statistics that were collected for the first time by the Department for Education (DfE) in 2015. Even though the data are not comparable between years due to changes in local authority (LA) reporting, these data allow us to see the areas of interest in missing LAC for 2017/18. To complement this analysis, I have also looked at the recently published Ofsted Fostering in England data to give a greater insight into missing incidents specifically for children in foster care. The latest Fostering in England data were published in January 2019 and you can find an overview of the more general themes coming out of the data here. Who are these missing children? The published statistics define a ‘missing child’ as a looked after child who is not at their placement or a place they are expected to be (e.g. school) and their whereabouts is not known. At a national level, there were 11,530 children who had a missing incident in the year to 31st March 2018. This was 11% of the children who were looked after in the year, with 56% of those missing children being male. Over half (52%) of missing incidents in the year involved LAC aged 16 or over with the remaining proportion largely being LAC aged between 10 and 15 years old. What are the features of the missing incidents? The 11,530 children who had a missing incident had a total of 70,250 missing incidents in the year to 31st March 2018, an average of 6.1 missing incidents per LAC who went missing. Of the LAC who went missing, 7,460 (65%) went missing more than once during the year. It would be interesting to have more granular data on these 65% of LAC to know the distribution of how many times these children have gone missing more than once. This would let us see whether it is a small number of children going missing multiple times that is driving the numbers or if the distribution is more spread. 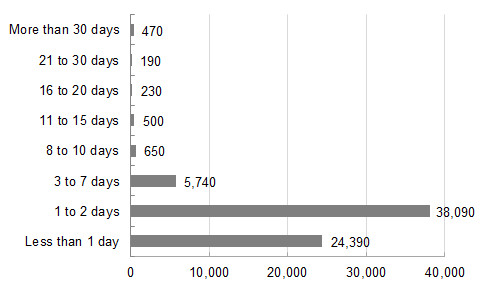 Of the 70,250 missing incidents in the year, 89% of them lasted for 2 days or less while only 1% of missing incidents lasted for more than 30 days. 48% of these 70,250 missing incidents were by children who were based in secure units, children’s homes or semi-independent living accommodation. A further 29% of incidents were by children who were in fostering placements. How does this look at a local authority level? The national data on missing children only tells part of the story. Delving deeper into the LA data gives us an indication of how missing data compares across England. 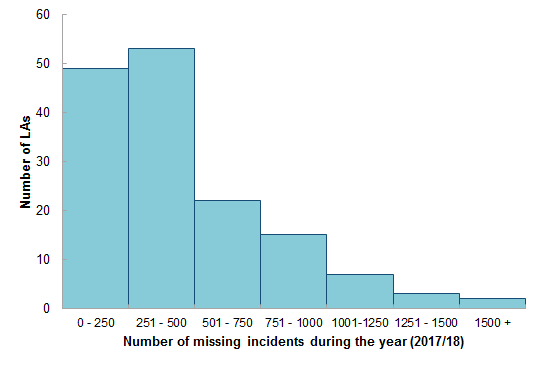 The chart below shows the spread of the number of missing incidents during 2017/18 by the number of LAs. Of the 151 LAs included (City of London figures are not published in order to protect confidentiality) a third had less than 251 incidents with another 35% having between 251 and 500 incidents. However, looking at the number of incidents in isolation doesn’t take into account the number of children who go missing and whether within LAs, there are a few children who go missing many times or the missing incidents are more spread out. 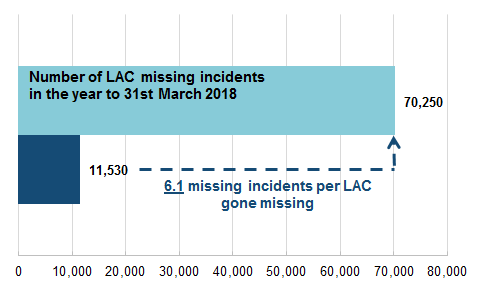 Looking at missing incidents as a proportion of the number of LAC who went missing gives an average for England of 6.1 missing incidents per LAC. At the high end, Richmond upon Thames reported an average of 14.3 missing incidents per LAC who went missing and Bath & North East Somerset reported an average of 2.4 missing incidents per LAC who went missing at the low end. For Richmond upon Thames, the high average figure is due to the fact that only 26 LAC went missing in 2017/18 but these children had 372 missing incidents. As the data are still improving, there is some uncertainty around the numbers but this should provide a starting point as to which LAs should be looked at in greater detail to understand the reasons for their level of missing incidents. For example, in 2017 and 2018 some local authorities informed the DfE that they do not record incidents as ‘away without authorisation’ but instead report all incidents as ‘missing’ to maintain consistency with local police reporting. It is estimated this could mean an overestimate of missing incidents of up to 3% in 2017 and up to 8% in 2018. Richmond upon Thames is one of these LAs and this would mean that the average of 14.3 missing incidents per LAC would go down to 13.2. 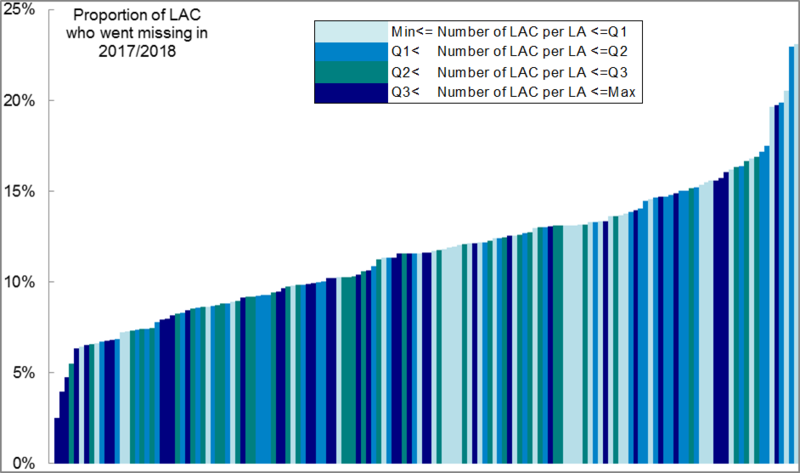 Looking at the relationship between size of LA and LAC going missing, the chart below combines both the size of the LA (measured by the number of LAC in that LA) with the proportion of LAC who went missing in 2017/18 per LA. The colours of each bar represents the number of LAC in a LA – the darker the bar, the more LAC in that LA, split by quartile ranges. The substantial variation in the proportions looks like a real effect and not just due to the small size of some LAs. Even though the left side of the chart with the lower values seems to have slightly more of the larger LAs, this relationship isn’t clear cut. 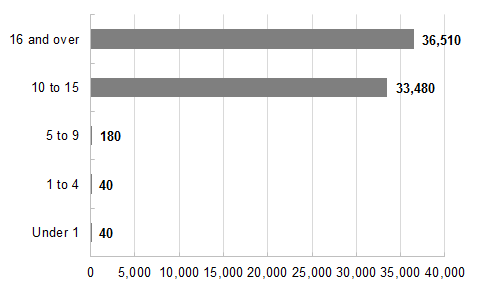 The LAC data does not give a breakdown of the reasons why looked after children go missing. 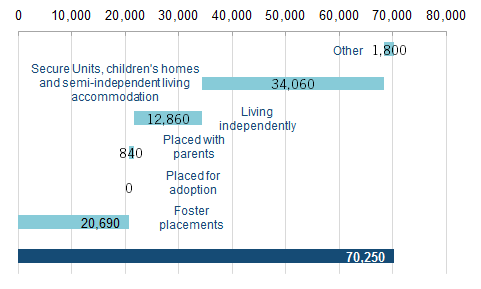 To gain an insight into this, we can look at a subset of the LAC population: children in foster placements. Based on the most recent data published by Ofsted for 2017/18, contact (including avoiding contact) with family or friends was the most common reason for going missing for children in foster placements. However, the proportion of missing children whose reason for going missing was ‘unknown’ rose to 18% in 2017-18. A key way we can try to understand the reasons why children in care do go missing is through Return Home Interviews (RHIs), which are designed to give the child and the placing LA a chance to discuss why the child went missing and agree actions to try and prevent further instances of going missing. RHIs should always be offered to children and young people when they return from going missing but only 57% of children in England who went missing in 2017/18 had a RHI. A proportion of the remaining 43% may reflect children/young people (CYP) refusing to undertake a RHI but the size of this number (2,965 children) remains significant and affects our ability to fully understand the reasons for why children go missing. There is also a significant disparity between LAs and IFAs when it comes to RHIs, with 60% of missing children placed with IFA carers not having a RHI in 2017/18 as compared to 32% of children placed with LA carers. It seems to me that a more detailed analysis on RHIs is required in terms of the disparity between LA and IFA placed children. What do we think needs to be done? Understanding why children go missing from their placement is important to help them stay safe and to prevent further missing incidents, especially since CYP who are at risk of child sexual exploitation are far more likely to go missing than those not deemed to be at risk of child sexual exploitation. The issue of ‘county lines’ and the criminal exploitation of vulnerable children has also become a significant issue, with the use of missing persons being a commonly reported feature of county lines activity. ‘County lines’ groups pose a significant threat to vulnerable children so understanding the ways this exploitation is carried out is key to protecting some of the most vulnerable LAC. As I have shown above, there is considerable variation between LAs both in terms of numbers of children going missing as well as the number of times children go missing on average. It would be interesting to understand why this is the case and whether there are any LA specific factors that are impacting the figures and how significant these factors are. One example is if some LAs have a higher proportion of CYP that are placed far away from friends and family and so go missing more often to see them. Another example is CYP going missing more in LAs where the quality of care is lower than other LAs. What trends are you seeing and what are some of the reasons for the levels of missing children in your LA? The proportion of return home interviews that are being carried out have increased slightly year on year but the fact that only 57% are being carried out needs to be further understood. Currently, the published Ofsted data doesn’t provide any breakdowns of the RHI data e.g. demographics of CYP who take part in RHIs or characteristics of the missing incidents which lead to RHIs. As a result, it is hard to assess how worrying this 57% figure is. More granular data on RHIs would be useful in giving us the ability to assess the risk to children going missing as well as evaluating the usefulness of a RHI in protecting those children most at risk. For example, we may be less worried about RHIs not carried out for missing incidents involving older children who miss their curfew by a few minutes as compared to other more substantive incidents. RHIs can be a key way to build relationships with young people who go missing and to subsequently implement follow-up support for the young person. There are a variety of reasons why these RHIs may not be carried out such as the CYP opting out, several missing incidents occurring within a short space of time and one RHI being carried out for them all, or a RHI not being deemed necessary (if the incident was very short for example). There may also be issues around what specific LAs define as a ‘complete RHI’ as part of their statutory duty. For example, contacting the young person but getting no response could be recorded as complete as the LA has carried out their statutory duty to offer a RHI. A better understanding of LA specific practices when it comes to RHIs would be useful as well as unpicking the reason as to why 18% of the reasons in the data published by Ofsted are ‘unknown’. Even though there is statutory guidance that a RHI must be offered when a CYP is found, there is no guidance on what information to collect or how to collect it. There’s also no guidance about how information from RHIs can be shared across LAs. As a result, there is no good picture of the quality of RHIs and there’s no ability to identify issues and patterns across the country. Identifying these national issues is vital if we are to get a handle on some serious problems, including the prevalence of ‘county lines’. Why do you think more RHIs are not carried out and what should we be doing about it?